Hadassah International encourages you to bring a smile to a child in the Hadassah Hospitals. Hadassah United Kingdom (UK) has mounted a grass roots appeal to support Hadassah’s Dream Doctors. The Hadassah Medical Clown program is totally dependent on donors to fund this remarkable work. 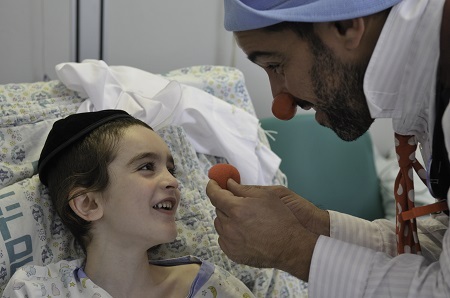 Hadassah UK has secured a donor who will match all donations, so a $24 donation will pay for one hour’s work of a Medical Clown at the Hadassah Hospital. Celebrate the festival of Simchat Torah- the joy of the giving of the law, by bringing the Simcha into Simchat Torah and increasing the value of a sick child’s smile. Every day, children are in hospital suffering from life threatening illnesses. Their childhood is paused, their days are spent in hospital receiving treatment instead of playing outside in the sun with their friends. Studies have shown medical clowning significantly reduces the pain and anxiety children experience in hospitals every day. Simchat Torah is right around the corner but in Hadassah hospital, there are still a lot of sick children so together we can make them smile and feel the spirit of the holiday. All you need to do is make a small donation as we have a sponsor who will match your donation from NOW until the end of October. Each £1 donated will be DOUBLED! So, it will now cost only £18 instead of £36 to fund a full hours’ worth of Hadassah’s Dream Doctors or only £90 for a full five hours. Please help us & click here to donate.